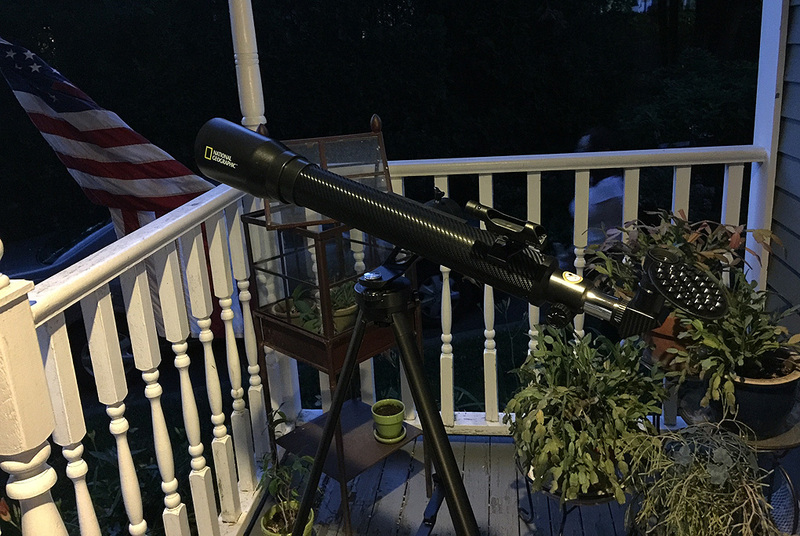 We took a FirstLook at the National Geographic CF700mm telescope at the beginning of June, but only got a clear enough night for its FirstLight debut recently. The CF700mm is really light and setup was simple. The tripod extends to a comfortable viewing height, and may also be retracted for those who wish to do their observations seated. We found the tripod to be sturdy enough and the vibrations from adjustments settled down relatively quickly. However, fine adjustments were a bit frustrating when using a higher power ocular. Still, the CF700mm would make an excellent “first telescope” for someone getting started in Astronomy. When we used the telescope for the first time we made the rookie mistake of not aligning the red-dot finder with the scope before using it. 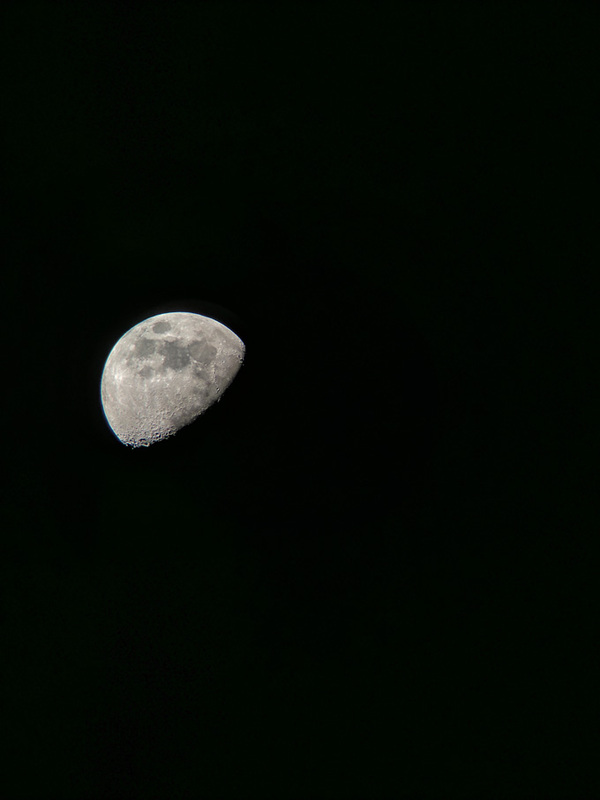 Not having things aligned made it a lot more difficult to locate even the Moon…doh! We WILL be sure to make the finder-to-scope alignment during the day before our next outing with this scope!!! The problem with trying to see something with a telescope is this: it is hard to know whether you are not seeing something because it is out of focus or because it is not in the field of view. 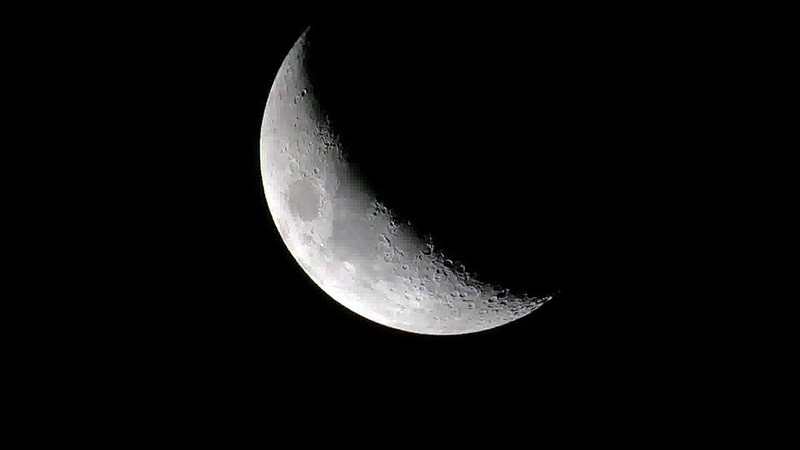 Still, by trial and error, we managed to stumble upon it (i.e., the moon). Once we were able to see it, we then had no problem bringing it into focus. 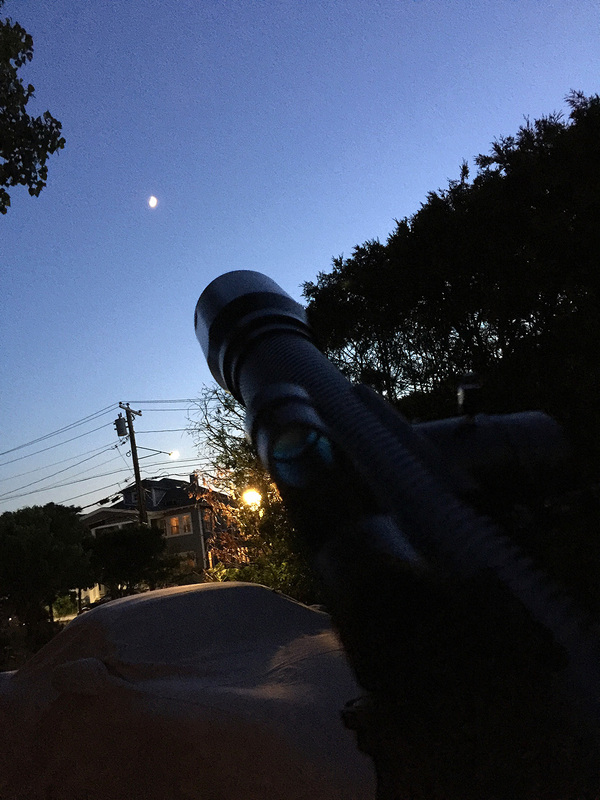 The view through the 26mm Plossi eyepiece was not bad for something as visible as the moon…bright and with reasonably good contrast. The adjustments for focus, while smooth in action, was a little coarse in the range of movement. It may be an issue when trying to focus on the planets. We shall see. We will talk about how we corrected the issues we had with taking afocal images in a future post. 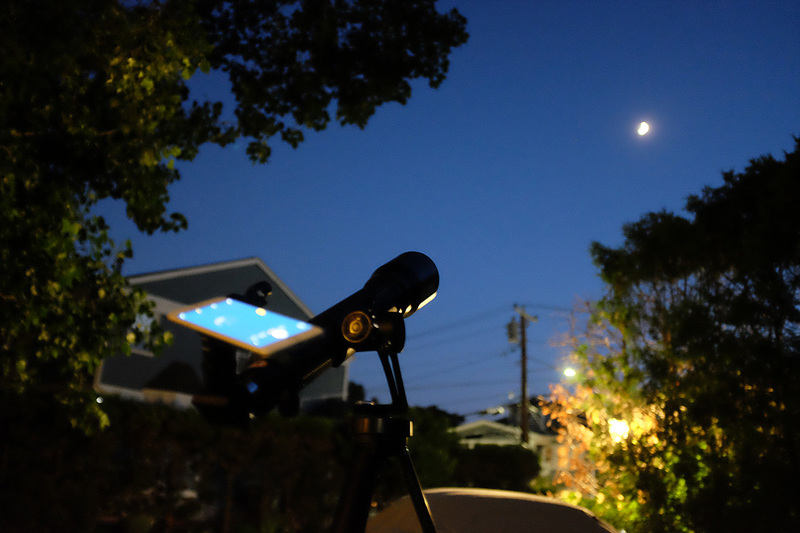 Suffice to say it IS possible to get a pretty decent image/video of the Moon with an iPhone and this NatGeo telescope! 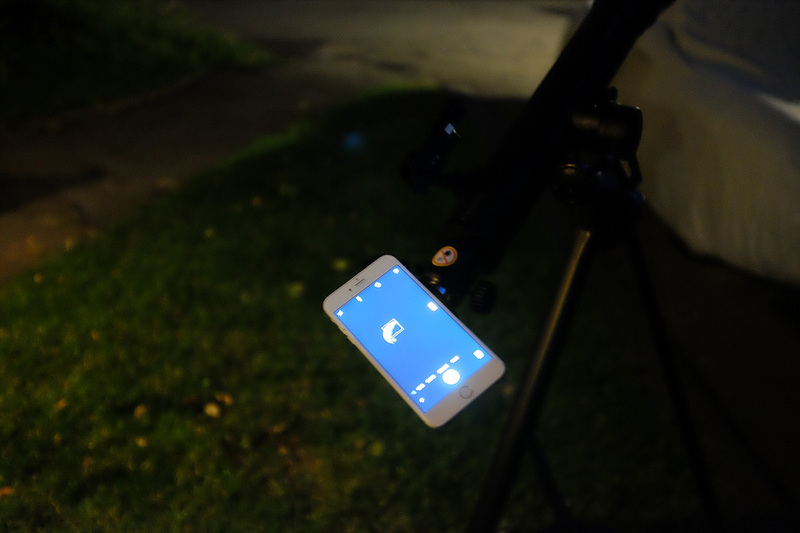 A few nights later, we went back out with the Google Pixel to see what we could get with that smartphone. 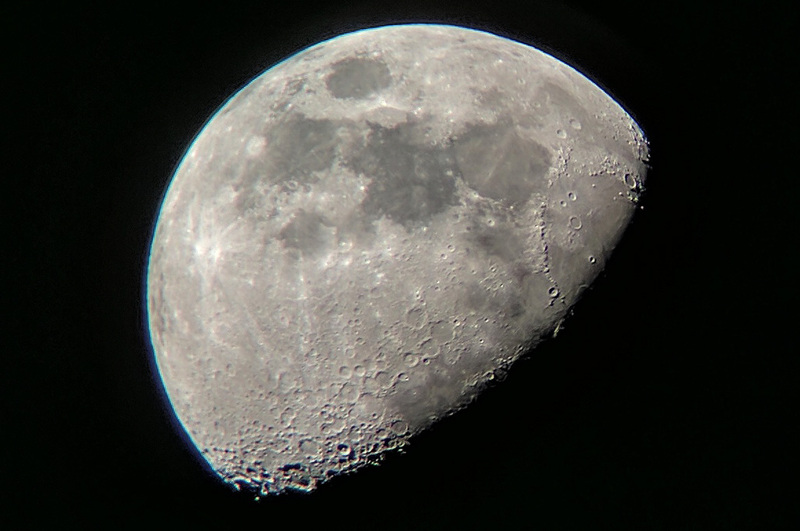 It took a little fiddling, but we cannot believe we were able to get an image this good with a $100 telescope and a smartphone! Below is the full rez of the image taken with the Google Pixel smartphone through the eyepiece of the NatGeo telescope. Yes, there is a little color fringe around the edges…but it WAS taken through the eyepiece of a $100 telescope with a smartphone!